With plump grains and a luscious nutty flavour, barley is a storecupboard staple in this house – and not just because of its use in brewing beer! I regularly throw a handful into a simple lamb stew, add to a Lentil Soup to produce a true meal in a bowl or, my favourite, use it to make a simple risotto. With Little Missy hitting pre-dinner meltdown around 5pm – just what is it with kids and that time of day? – and Small Girl simultaneously demanding her own supper, hands-off cooking is often the only way forward. Risottos at the cottage, whether made with arborio rice or any other grain, are invariably baked in the oven. What really lifts dish above the ordinary is the addition of some intense dried shiitake mushrooms. I sourced mine from Ballyhoura Mountain Mushrooms, a local company that is producing speciality mushrooms for the Irish market. They are the most pungent dried mushrooms that I’ve ever came across, putting dusty imports into the shade. One whiff of these and you will forsake all others. You can pick up dried and fresh shiitake and oyster mushrooms from Ballyhoura Mountain Mushrooms at Mahon Point Farmers Market on Thursdays or Douglas Farmers Market and Midleton Farmers Market on Saturdays. 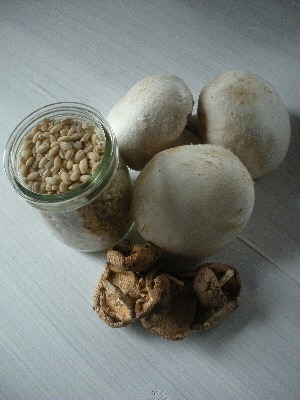 They also make a range of mushroom-based foods (I’m looking forward to trying out their porcini dust!) and, in season, stock a selection of wild mushrooms. As it stands, this is a great vegetarian meal but you can always meat-it-up by frying some bacon or chorizo with the onion and using chicken instead of vegetable stock. In an effort to get as many vegetables as possible into the family, I often finish this off with a couple of handfuls of shredded spinach. Some diced cubes of Ardrahan cheese have also been a popular addition. Put the dried mushrooms into a small dish, pour over 100mls of boiling water and allow to soak for five minutes. Preheat the oven to 180°C (160°C fanbake). Over a medium heat, heat half of the butter or oil in a wide, deep pan that has a lid and is suitable for oven use. Tip in onions and cook, stirring regularly, for about five minutes until softened. Add the garlic, stir well, then add the barley. Cook for a minute until glossy, pour in the wine and simmer until reduced to almost nothing. Fish the now-reconstituted mushrooms out of their water and chop finely. Strain the soaking water. Add both to the pan with the thyme, stock and tomato paste; bring to the boil, season, cover and put into the oven. Bake for 40-50 minutes until the barley is tender. Meanwhile, heat the rest of the butter or oil in a frying pan over a medium-high heat. Fry the quartered mushrooms until browned. Squeeze over the lemon juice. Set aside until the risotto is cooked, then fold the mushrooms and juices through the barley. Sprinkle over the parmesan and serve with extra if necessary. Yum! I love risotto and have never made it with barley so this is one for the must-make list. I must also check out Ballyhoura Mountain Mushrooms. They sound great! I bought a box of Ballyhoura’s dried shiitake mushrooms recently and they’re getting used in lots of different dishes. The plain old button mushrooms always need some bit of help! Wild mushrooms are not appreciated very much here – I think people are just too nervous to pick them for themselves! I love field mushrooms and hunt for them every year but that’s the extent of my mushroom-picking experience. I’m a huge fan of mushrooms and this sounds gorgeous. I’ve never thought to use pearl barley this way but I too like to throw it into stews. Yum! It’s a good way to make some meat in a stew go a little further, isn’t it? Always good to have a few of those tricks when trying to stretch the expensive ingredient!